Recently I sat across from my neurologist. We were quiet; aware of the seemingly peaceful, invisible elephant in the room. Once again, I had done my best to express the urgency of my symptoms. There is a relentless battle going on in my spine, my skull, muscles, and nerves that affects my every movement, every moment, due to a rare, congenital cervical fusion in my cervical spine. We’re at a dead end with treatments that might help me tame Klippel-Feil syndrome. We continue to look at each other. He has nothing for me. I know it. But here we sit. He changes the subject, asking, “How is your support group going?”. Frustrated, at first a part of me wants to say, “Thankfully it’s going well, because I’m going to need it after another tough appointment.” Instead, he triggers my innate will to overcome this, and my positive outlook. I tell him it’s going well, which is true! I continue on sharing that Awareness Day is on Monday, August 6th, just a few days away. His question is a diversion. He’s doing his best to remind me of the positive mission I’ve been on, despite my own situation. He asks me what other patients are doing with their care. I say we’re mostly in the same boat. Then he says, “Ok, see you in six months?”. Six months until we do this all again. Six months. Do you feel me? When my symptoms increased in severity, and became debilitating overnight, I slowly built a team of specialists over the past 8 years. I learned I have several rare associated conditions, such as Ehlers-Danlos syndrome and Cervical Dystonia. Regardless of my specialists skill, willingness, and bedside manner, we usually end up looking eye to eye in silence, because there is nothing more to offer me. Currently, much of Klippel-Feil syndrome (KFS) care is spotty, and enormously flawed. Our patients and families try to maintain a new normal, which is often poorly maintained medically speaking, despite our efforts. Klippel-Feil syndrome has been dismissed for far too long. I know in my heart that motivated patients, parents, and engaged healthcare providers need to work together, to find better answers, to care and treat KFS. I believe that this is not just a dream, that it can become a reality. This is why I advocate for Klippel-Feil Syndrome. I have endless hope. I want a better future for myself, as well as infants to seniors affected by KFS, and their families. I won’t back down. I was not diagnosed until age 38, after a lifetime of issues that never made sense, including limb deformities in both knees. Back then, just eight years ago, I could not believe that there was so little information about Klippel-Feil syndrome available. What was available was grossly inaccurate and not based on the reports from those who actually live with KFS. I began to develop a central location where information and support was available publicly and internationally. Eventually I founded Klippel-Feil Syndrome Freedom, a new ThinkGenetic Advocacy Partner. With the knowledge and input of many other patients, parents and families, I continued to build resources for our community. Together we have shown strength, compassion, and maturity in the midst of adversity. 1. Today, Monday, August 6th, Klippel-Feil Syndrome Awareness Day! 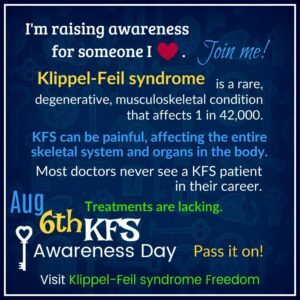 Klippel-Feil Syndrome Awareness Day began six years ago, when a small group of people decided a specific day each year should be set aside, to help the KFS community speak out about Klippel-Feil syndrome. The idea developed on the KFS Facebook page that I established. After a public vote, the date 8.6 was selected, because the GDF6 gene associated with KFS is located on the long arm of chromosome 8. The skeleton key is our symbol of hope and freedom for a rare skeletal disease. We encourage our patients and families to actively raise awareness throughout July and August. There are many ways to get involved! Click here to learn how to join us. 2. Research is key. 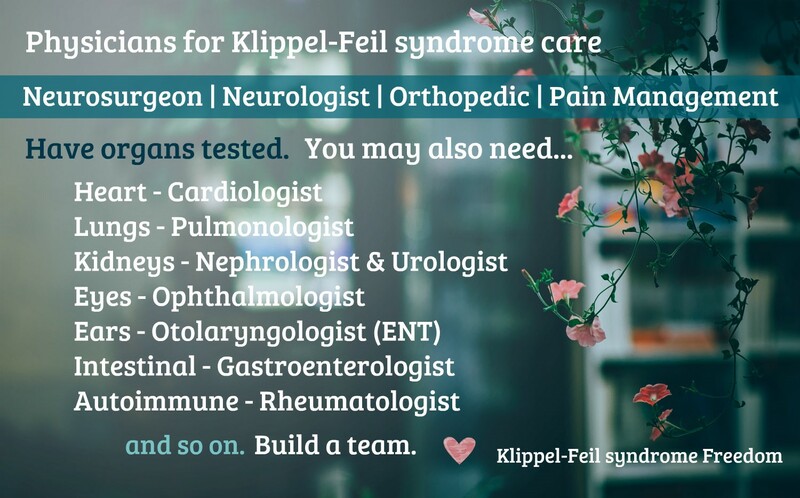 We encourage Klippel-Feil syndrome patients and parents to participate in our Patient Registry. The new survey is patient dreamed and patient developed by Emily Lemiska, who also has KFS. 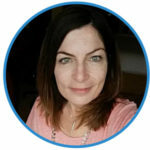 The survey is due to her dedication to improving lives for those with Klippel-Feil syndrome, as a patient advocate and board member of KFS Freedom. Together, we worked at length, reviewing and editing, along with our partners, Coordination of Rare Diseases at Sanford (CoRDS), and our lead geneticist, Philip Giampietro, MD PhD Section Chief of Clinical Genetics at St. Christopher’s Hospital for Children. The new survey is specific to Klippel-Feil syndrome, and your participation will accelerate KFS research. 3. Speak Up! I have a developed passion for raising awareness about adults with rare disease, like myself. Our system is not set up to support adult rare disease patients but we are the other 50%. I urge adult rare patients to use their unique talents and skills to advocate for our needs. It doesn’t take any special training. Take me for example, I am an interior designer who never dreamed that I would be advocating for a rare medical condition. Now, I’m an interior designer stepping into new territories. I’ve found that using my visually creative side in the rare disease arena has made a positive impacted for others. Often I may feel ill equipped to navigate this space. Actually, I am exactly that -”ill equipped”! You know what? You don’t need a medical degree to advocate for your rare disease, you just need genes and a story. Never feel that what you can offer is not going to make an impact. It will. 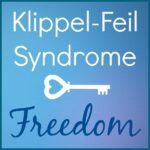 Klippel-Feil Syndrome Freedom is excited about our developing collaboration with ThinkGenetic. As partners we strongly support the importance and critical need for care and treatments for patients of any age. Additionally, because KFS is degenerative in nature, affecting patients throughout their lives, we think this collaboration is another step towards reminding doctors, researchers, and government agencies like the FDA, that rare disease patients who are adults often hold the keys to discover new treatments and therapies, Adults with rare disease have years of experience and ideas for solutions.Embrace adult patients within our rare community. Make accommodations so that we can have a seat at the table, because we’re filled with answers. We literally are the reason for the cause. We don’t want our experiences to happen to today’s kids. Include us. Only then, can we build a better system for rare patients of all ages. KFS Freedom empowers and unites patients and their families through peer support, education, research, & advocacy, for a lifetime of improved health care. Learn more at facebook.com/KlippelFeilSyndromeFreedom or find us on Twitter and Instagram @kfs_freedom. ThinkGenetic enters into Advocacy Partner agreements with organizations, support groups and charities to share information, increase public awareness of genetic conditions and provide trustworthy resources to those living with or caring for someone with a genetic disorder. Learn more and view current partners at or email us for information about enrollment in the program. This is an article that gives me hope for better care for infants, children, and the adults that juggle multiple specialists seeking care. A central research based file repository of the survey by the adults and caregivers of those under 18 years of age will be a good thing. 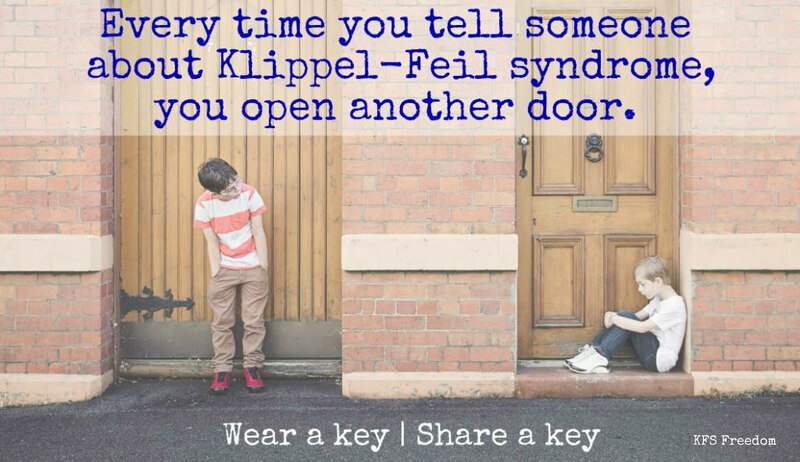 If you or your child has Klippel-Feil Syndrome or Klippel-Feil Anomaly, please take the time to do the survey. You give me endless hope my friend. Congratulations on your new partnership with ThinkGenetic, they are lucky to have you. I am encouraged and hopeful for my daughter going forward. When my beautiful baby girl was born 30 years ago there just wasn’t enough info about KFS. At the age of 23 I struggled to understand what was happening to her …I read everything I could find and spent the vast majority of my 20s and 30s scared out of my mind. I felt at times I was educating doctors on information I found in the medical libraries. Eventually we built her team of doctors through Floating and Childerens hospitals in Boston. Today the knowledge my daughter has as she starts her own family is so much better and it’s thanks to you folks. Thank you for being here and doing this much needed advocacy. To all new mothers…it will be ok….there people here who can help and ways to have your voice heard. Thank you to everyone who supports those affected by KFS and our mission to conquer a rare skeletal disease. We are honored and excited about our new partnership with ThinkGenetic. Working on this blog with Ruth was a swift and invigorating process. We believe that ThinkGenetic’s active pursuits and ours, will be a #KFStrong force against KFS, and all rare diseases.